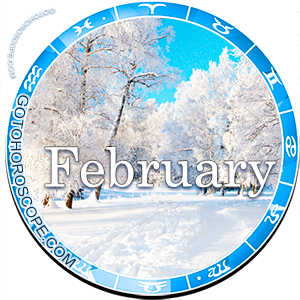 February 2015 Horoscope Capricorn, free Monthly Horoscope for February 2015 and Capricorn Astrology Forecast for the month ahead. 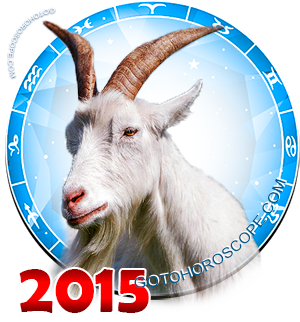 For the representatives of the zodiac sign of Capricorn February 2015 will not be the most outstanding month. The thing is that Mars, traditionally playing the role of the planet-exalt of this sign, will change his preferences and due to some general combinations will radically change the direction of his emanations. At the same time, Jupiter will join Mars; Jupiter is usually not sympathetic towards the Capricorn, as he is responsible for the fall of this sign. He will also be significantly reinforced by some general combinations and his negativity may prove to be truly harmful for the Capricorn, especially in the sphere of finances. The Moon, responsible for the expulsion of the Capricorn, will maintain her classic position and will crash the waves of moderate negativity on the sphere of relationships and feelings. The Sun, which in the current period will play the role of the "celestial leader" of the Earth trigon, will attempt to at least help the Capricorn sign, although it is unlikely that the help will be sufficient. The only good news is that Saturn, the planet-ruler of Capricorn, will remain by the side of this sign, which means that all of its representatives may hope for some support. The sphere of entrepreneurship, as previously stated, will not bring great news to Capricorns in February 2015. It is here that the energy of most negative planets will be concentrated. What to do in order to minimize your losses? The best option is to swim with the tide, without paying attention to the passing whirlpools and other unpleasant obstacles. The stars do not say that you should helplessly drop your arms into your laps and calmly watch as your career tumbles. On the contrary, you should aim to solve problems prior to them occurring; surpass your enemies and competitors by using diplomacy, trickery, and any other methods you see fit (except for the honestly dishonest ones). Just do not aim to implement the plans you have at their maximum, do not jump over your head and be calm when evaluating the situation. Your biggest task right now is to maintain what you have, not to multiply it. Imagine yourself in a sieged castle, awaiting for upcoming support to arrive. Going into open battle would be a serious mistake, while planning your strength to support yourself for the required time - that is the correct decision. 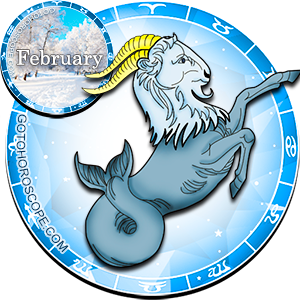 The sphere of personal relationships is unlikely to seem so negative for the Capricorns in February 2015, although it is here that most catastrophic events may occur. Do not worry, the real danger lies in being idle. Be attentive and try not to miss anything coming your way, an abruptly dropped phrase may be very important for you. Just do not fall into paranoia and do not aim to see the enemy in everyone around you. Keep cool, especially since you have a trusty ally - your lover. It is her who will be a true island of peace along the raging storms, she will help you calm down, focus, and find your way. If you are along, then the situation is slightly more complicated, as neither your friends nor relatives will be able to help you. Nevertheless, you will be in a condition to overcome the situation, instead of letting it overcome you - you have Saturn on your side. Think about his status as the Ruler of the Celestial Rivers of Time and you will see where your strengths lie. This February is horrible for me also. .yeah this is so true.. awww.. i dont have any partner in life..
i think this is true obivously for me, the start of my feb month is very common wiht Capricorn detail provided here, it is matching with my condition is. This is great reading for Capricorn. Hope the year 2015 will be fabulous for me.